Netflix also provides the option of showing notifications to the user suggesting some recommendation to the user regarding shows and movies. The suggestions are provided to the user by considering their previous history of watching shows and movies. Sometimes the users can find these suggestions a little annoying. In those cases, here is how the users can stop getting these recommendations for unwanted movies on Netflix in a very easy and simple manner. The first step is to open the ‘Netflix’ mobile Application. By opening the Netflix application, the user can view the list of popular movies and the new episodes available on Netflix. In the Netflix mobile Application, you can tap the ‘menu button’ at the top corner i.e. the three lines. You will now be able to access all the options available on Netflix. From the list of menu options that are listed select the ‘App Settings’ to view the list of settings available for this application. 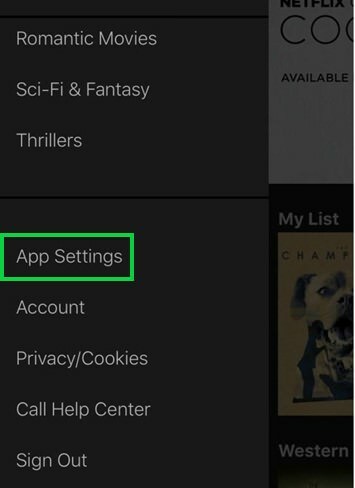 In the app settings, uncheck the ‘Accept Push notification’ to stop receiving the recommendation for the shows or movies.